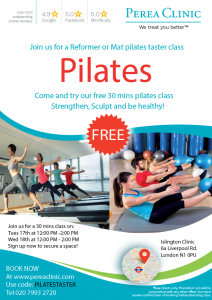 Join us for our Pilates Taster Event! Come and try our free 30 mins Reformer Pilates or Mat Pilates class in Angel N1, close to Angel station. Pilates is a wonderful form of exercise that can benefit you in so many different ways. If you haven’t yet tried Reformer Pilates or Mat Pilates, this is your chance to. Our Pilates classes at the event are for all pilates lovers. These classes will help you if you are an absolute beginner or looking to get back into Pilates. What type of exercise is best during pregnancy? Pilates during pregnancy? Is it something you should consider? Let’s face it, the thought of going to a busy gym during your pregnancy can be less than appealing. In addition to this, the list of do’s and don’t’s during pregnancy become a lot longer too. Now you have to consider what is best for your health and the unborn child’s health. It need not be intimidating though. Exercise during pregnancy can be fun and beneficial in the hands of a professional. We take a closer look at how Pilates may benefit you. Pilates is growing in popularity, but is it right for you? Pilates has captured the public imagination over the last few years. Aerobics was popular throughout the 1980’s. In the 1990’s, step became all the rage. However, since the turn of the new Millenium, the growth of yoga and other mindful-based exercises have indicated a shift in how we choose to take care of our bodies. Higher intensity exercises certainly have their place, but there is now an increasing awareness of the need for good muscle balance and improved posture. In general, exercise has become more scientific, and there is a now a greater emphasis on holistic health. We take a closer look at this paradigm shift.